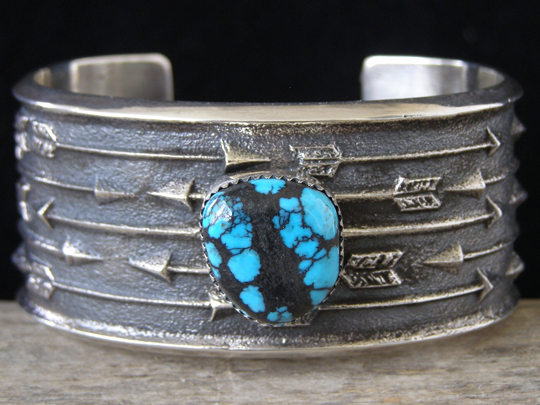 Kevin Yazzie Chinese Turquoise Sandcast Bracelet size 7"
This stunning cuff is decorated with five rows of arrows in flight. He carved his mold so that there is a beveled lip on the edges of the cuff, which is a nice stylistic detail. He set a very thick free-form stone of natural, untreated Chinese turquoise in a serrated bezel. This is a lively blue color with black matrix and webbing in the stone. His sandcast design employs the classic motif of the arrow in flight and he rendered his design so that it shows his adeptness at carving in perfect symmetry, yet the design does not become sterile and repetitive. Superb!